As part of their European Tour 2008, I Am Kloot from Manchester came to the Conrad Sohm in Dornbirn/Austria last Saturday, November 15 2008. Their support act, beginning around 9:00pm, was the Swiss band Mañana. 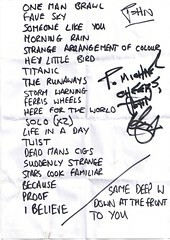 Although they state their influences being Doves, U2 and The Verve, I'd say they're a nice mixture of Keane and Elbow. You should really check them out. Then at 10pm, after having watched the support act from their merchandise table, I Am Kloot entered the stage and did a set of no less than 21+3 songs. Kicking off with their regular tour-starter "One Man Brawl" they played eleven more songs until the band left John Bramwell solo on stage. 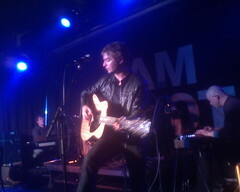 There he played two songs, including my favourite, Astray, solo on acoustic guitar to be later joined by the band again doing eight more songs including "Twist", "Proof" and "The Stars Look Familiar". After having completed their regular set the about 500 people (my rough estimation) longed for more and got "The Same Deep Water As Me", "Down At the Front" and the most beautiful tune of the evening "To You". What's up next in the Central European/Western Austrian Area? Chuck Berry's rockin Innsbruck, "Best German Act" EMA winners Fettes Brot in Hohenems, and a whole bunch more, have a look at SOUNDEVENT for details!